Why would a homeowner on a very stable electrical grid want to generate and store electricity? In April, we asked if a German subsidy on energy storage could replicate the German solar miracle -- but for batteries and energy storage systems this time. The answer is "no," at least with the subsidy and process in its current form. In fact, according to Christoph Ostermann, CEO of Sonnenbatterie, there were fewer than 500 applications for the energy storage loan as of two weeks ago. Markus Hoehner, CEO of Hoehner Research and Consulting Group, confirmed that the number was limited to a few hundred applications by mid-June. The long-threatened energy storage subsidy was introduced on May 1. 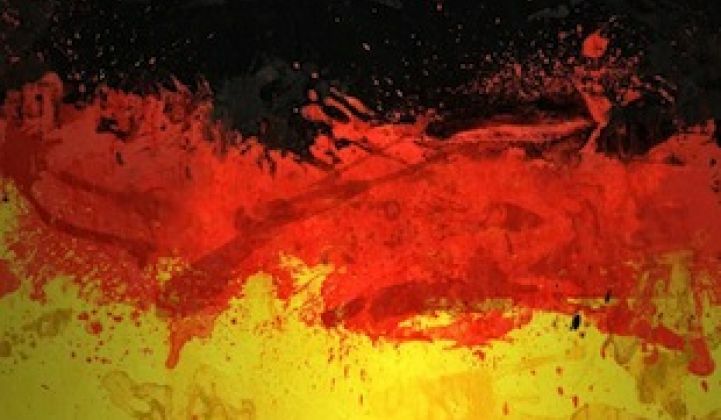 Loans come from German government-owned development bank KfW, and the 30 percent subsidy on the battery system is financed by Germany's Federal Environment Ministry with a reported grant fund of $65 million. The same reason that the German solar tariff works so well is precisely where the storage subsidy fails and creates a bottleneck, according to Ostermann. While the process for participating in the German solar feed-in tariff is straightforward and light on paperwork, the process for the energy storage subsidy verges on American in its utter complexity. The energy storage system is meant to be used in tandem with distributed solar installations with storage systems developed in Germany; the funds come with a maximum size requirement of 30 kilowatts. The batteries must have a warranty of at least seven years to gain the subsidy. Another requirement is that the PV installation must send 60 percent of its capacity to the grid over the lifetime of the plant. The battery subsidies will apply retroactively when connected to solar systems installed in 2013, according to reports in PV Magazine. Presumably, the initial battery systems will be lead-acid technology, which might give way to lithium-ion or other emerging battery formulations as prices fall. As to why a homeowner on a very stable electrical grid would want to generate and store electricity, Ostermann said the German residential customer is fed up with high electricity prices and wants independence from the utility. In the U.S., the motivation often seems to be the desire for backup power for when the grid goes down for technical reasons or during natural disasters -- as well as a hedge against utility pricing. We've covered this in reports on storage from SolarCity, Stem, and Demand Energy. As Hoehner put it, while the solar industry in the era of high feed-in tariffs was “all about making money,” the new era of falling feed-in tariffs and falling solar panel prices has shifted the emphasis: “It’s all about saving money,” he said. Jeff St. John notes that because the typical German home uses far less electricity than the typical U.S. home, 4.5 kilowatt-hours is enough to “keep the power on all night long.” That’s important for a customer seeking energy independence as an end goal, rather than sizing their battery system merely for backup power when the grid fails. Note the relatively modest amounts of energy storage in the EU. This chart is from the Azure International/GTM Research report China Grid-Scale Energy Storage Market, 2012-2016.